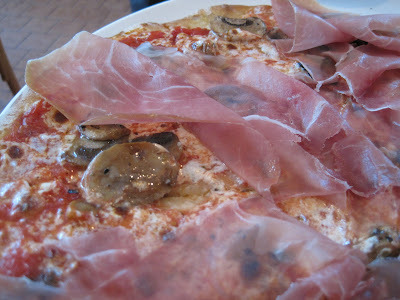 Almost exactly a year ago, we dined at Piccolo Forno for the first time (last year's post here). Sadly, despite our best intentions to return sooner rather than later because we enjoyed it so much, it was a year before we made a return trip. This time, we dined rather early because we had been out doing a few errands, which we finished faster than we expected, and we didn't feel like trying to kill time. Also this time, we did not take a bottle of wine. Neither of us felt much like drinking wine plus I haven't been sleeping well and sometimes a glass or two of wine keeps me awake instead of helping me sleep! So last Saturday around 5 pm we pulled into the small parking lot for Piccolo Forno. We opted to sit inside instead of outside and we were seated right away. By the time we left around 6:30 pm, all the outdoor seats were occupied and there were people waiting for tables. I'd like to say that we tried new menu items this time, but since it had been a whole year, our meal choices were quite similar to the last time. We again started off with the Crostini di Polenta appetizer: It's a good sized appetizer. 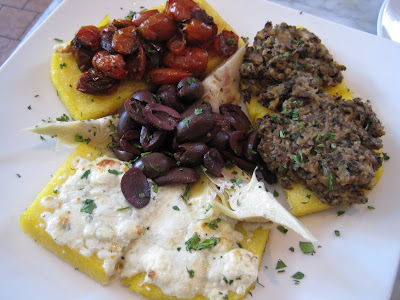 Squares of baked polenta topped with goodies and in the center of the plate, a mound of kalamatas and artichokes. There were two squares topped with a mushroom spread: Two squares topped with marinated and roasted tomatoes: And two topped with gorgonzola: The tomato squares are our favorite. I remarked to SP that these polenta squares tasted so much better than when we made polenta pizza. I don't think it was the toppings that made the difference. 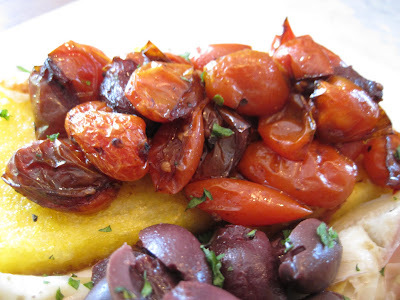 I think the polenta base was just that much better than ours! Of course SP had to order the soup. I thought he was a bit nuts because it was such a warm day, but he does really enjoy soup. I think it was a tomato/roasted vegetable soup. I tried a spoonful and it was delicious. I picked out a strong fennel taste and remarked that it tasted sausage-y because of the fennel, but there wasn't any sausage. 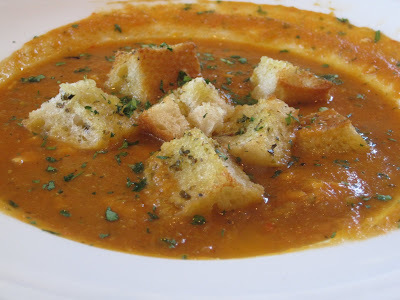 The croutons were delicious - crispy but when dunked in soup, nicely soft and full of tasty bread-soaked-with-soup texture and flavor. 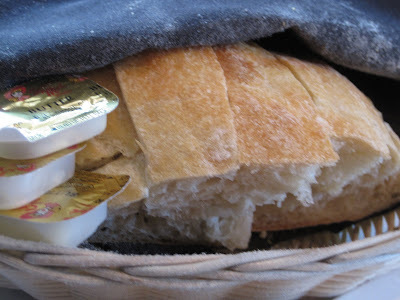 There also was a basket of bread, but it showed up after we ate the soup and polenta appetizer, so we didn't eat any of it. 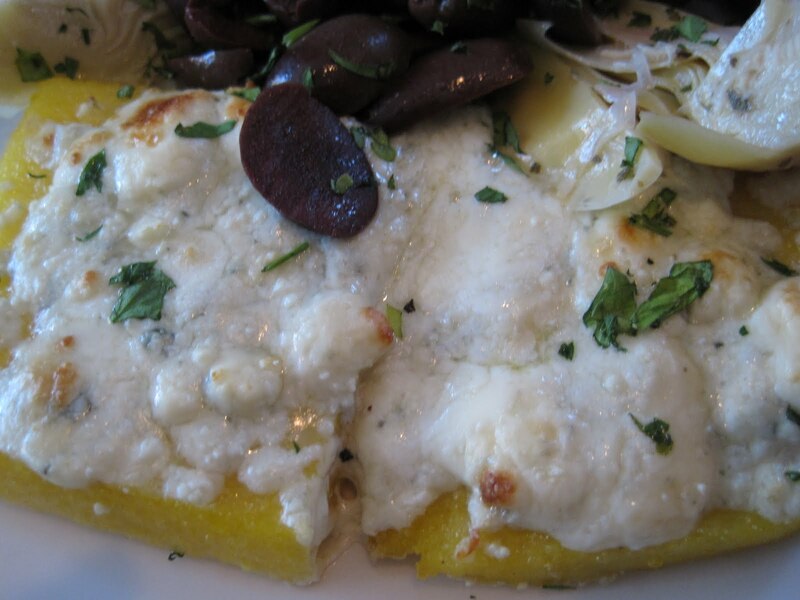 Like last time, we decided to share a pizza and a pasta. Last time we had the arugula & prosciutto pizza. 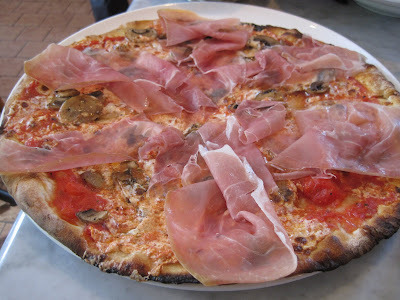 This time, mushroom and prosciutto pizza: The pizza was very tasty. A nice, thin, chewy, crisp crust. Enough cheese and sauce to be tasty but not overly wet (too much sauce) or overly greasy (too much cheese). Thick slices of mushrooms. Lots of prosciutto. And still very tasty when eaten cold a couple of days later! 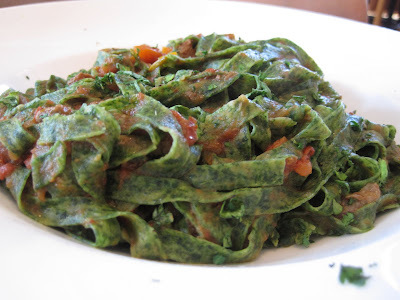 For our pasta dish, I really wanted to have the zucchini & prosciutto & ricotta stuffed canelloni again, but SP settled on Tagliatelle con Ragu di Agnello (spinach tagliatelle with tomato lamb ragu): It was very good. I enjoyed the spinach tagliatelle much more than I expected. I usually only enjoy good old white pasta. The green boxed pastas have never much excited me and I tend to turn my nose up at green pasta whenever we dine out. But this pasta - yum! It was a very lightly dressed pasta. I expected a heavy, saucy, chunk filled sauce, but instead there were very small bits of carrot and tomato and lamb with a sauce so lightly applied as to not be visible yet be very flavorful. We didn't finish this and brought leftovers home. We re-heated it on Monday and it was just so-so. I think this is a dish best consumed at the restaurant instead of taking home any leftovers. 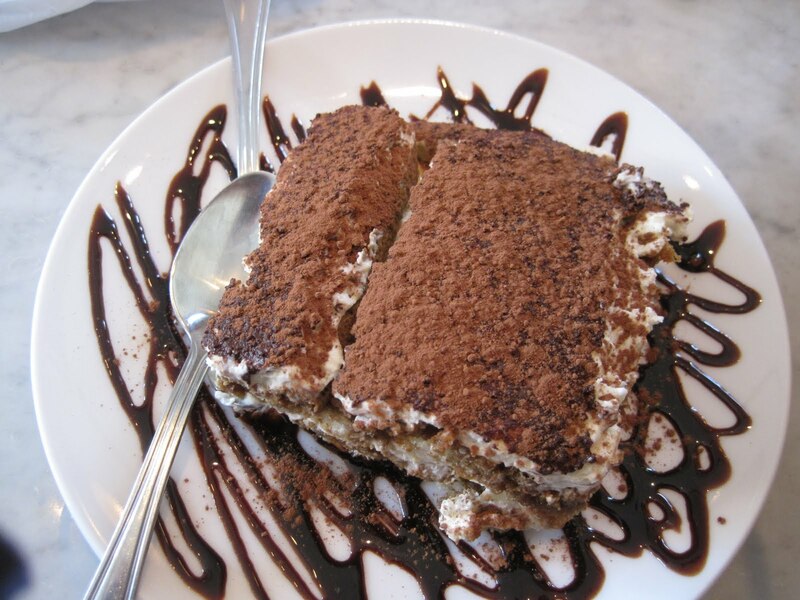 Last time, Piccolo Forno was out of tiramisu when it was time for dessert. I was crushed! Don't get me wrong - the desserts we had last time were extremely tasty. 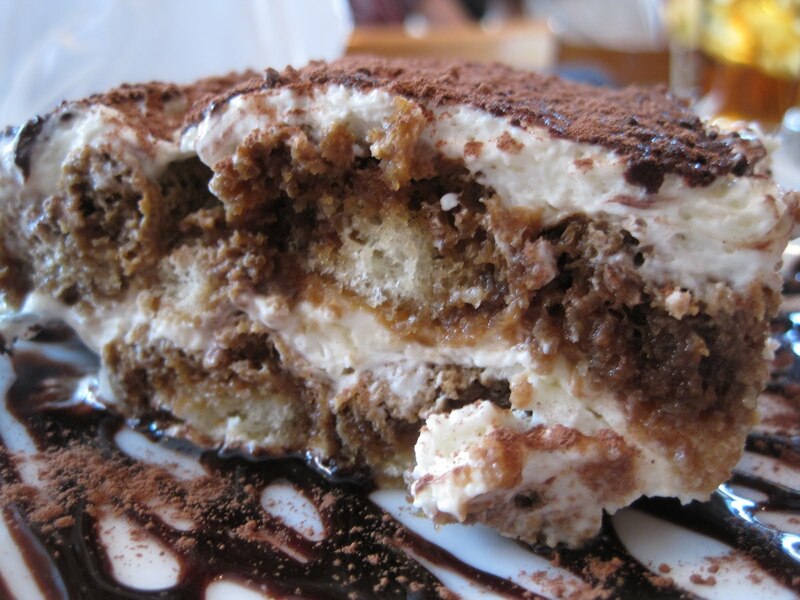 But tiramisu is one of my favorite, maybe my favorite, dessert. So more than anything, I wanted to try Piccolo Forno's tiramisu. Much to my delight, they still had some available: Oooohhhhh look at that tiramisu. I was full enough that SP and I shared instead of each ordering a dessert. I was kind of sad to share because it was so good! Of course, I really did have a hard time with my last couple of bites because my stomach was definitely a bit beyond capacity. It was moist. Flavorful. Light, not dense. All those wonderful tiramisu flavors. So delicious. Possibly the best tiramisu I've ever had, but then again, it has been a very, very long time since I had a really tasty tiramisu. We again had a lovely meal at Piccolo Forno. There are a few small quibbles. Yes, the wait for a table can get quite long later in the evening. Yes, I again found it a bit too warm inside (I drank a lot of iced tea because I got so warm and thirsty). Yes, I still found it a bit noisy/loud inside and had to lean toward SP to hear him and talk. And yes, the tables are not especially wheelchair friendly (I couldn't really get close enough). But the food is very good. Our server was very friendly and gave us a good amount of time to enjoy each part of our meal but not so much time as to really draw out the evening (after all, lots of people waiting!). For soup, appetizer, pizza, pasta, a dessert, and 2 iced teas the bill was about $52 (with tax/before tip), which seems pretty reasonable to me. The other patrons are really friendly as well, toting their BYOB wine and stealing glances at what everyone else brought to drink or what everyone else ordered to eat. 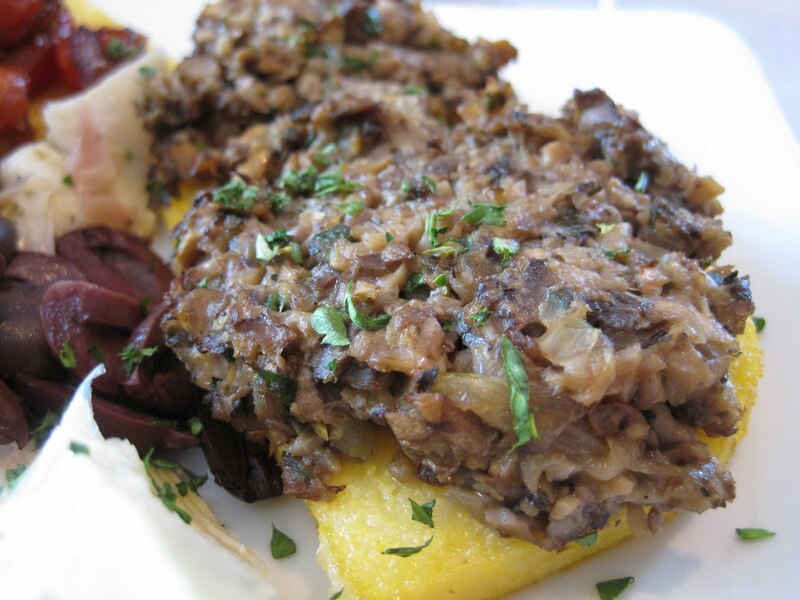 We are vowing to return to Piccolo Forno sooner than next June. We'll see how that goes! CSA #12 - Squash Blossoms!